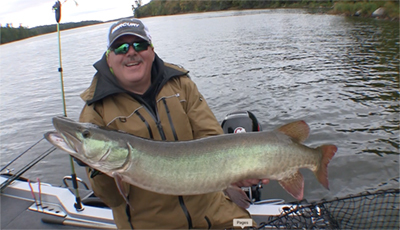 The musky is not the “fish of 10,000 casts,” but regardless if it takes a hundred or a thousand casts to catch a musky, the occurrence is still rare enough that a hooked-up angler should make every effort to boat a fish that bites. What you do in the minute or so after a musky strikes until you get it in the net will determine whether you go home with a camera full of fish photos or a story of the one that got away. Why do I say “minute or so”? That’s because a musky fight is rarely two minutes in length, regardless of how long it seems. 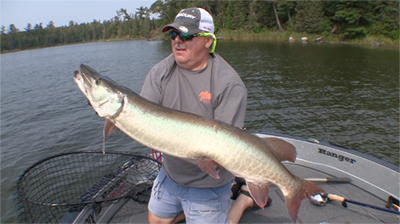 The shortness of a musky battle was one of the things that stood out to me when I started filming musky DVDs — most muskies are netted less than a minute after they’re hooked. Still, the fight is often spectacular and that’s why we do this. 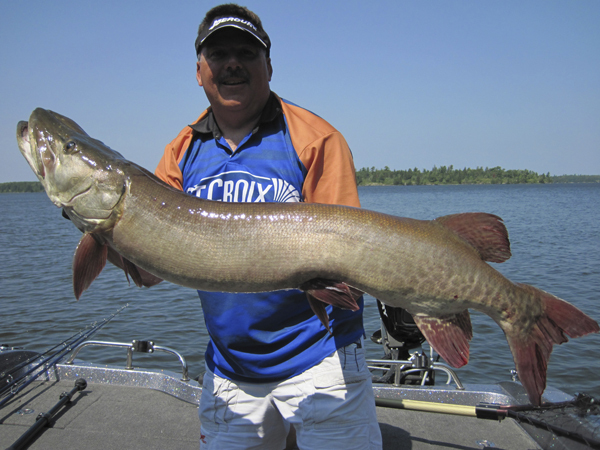 This giant musky was hooked outside the mouth, and author Steve Heiting fought it without pressuring it for fear it would throw the bait. Still, the fight lasted only a little more than two minutes, as proven by a TV camera. Muskies fights are usually brief but spectacular. 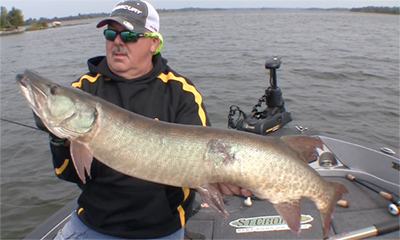 Fighting a musky right starts before you even launch your boat because there are a few things you can do to tilt the odds in your favor. First, sharpen your hooks so they easily penetrate a musky’s tough mouth. Second is how you rig up —use no-stretch line for better hooksets, and long rods. Rod manufacturers report that they are now selling more rods exceeding eight feet in length than less. Long rods not only offer longer casts and bigger figure-8’s, but important to this discussion they do a better job of setting the hook and, when a hooked musky is thrashing at boatside, they do a superb job of keeping the line tight and not allowing slack. It’s when a line goes slack that a musky is most apt to throw the hook. A third consideration is your reel’s drag. Set it tight initially so you get a better hookset, and back off the drag a quarter-turn or so later while fighting a fish. I tighten my drag until I care barely pull it off the reel’s spool. A big musky will still be able to take line if it wants. When a musky strikes, I set the hook hard. I want one solid lock-up with the fish. If the musky is charging the boat, this may take two or three swings of a long rod to get the hooks set, but in most cases one hard hookset is all it takes. If you like to see muskies thrash around on the surface and throw water, keep your rod tip up for the duration of the fight. The only problem with this approach is you won’t actually catch many fish. It’s far more efficient to keep your rod lowered throughout most of the battle because this will help keep the musky’s head in the water. Thrashing against the water’s drag, the fish’s actions are slower and require more effort than if its head is out of the water, thrashing against air. A good rule to follow is to keep your rod and line at about a 45-degree angle to the fish, and do the opposite of what the musky is doing. If it rises to the surface, lower your rod and try to force its head under water as much as possible. If it dives, raise your rod. In both cases, you are making the fish fight against the rod’s action, which will eventually wear it out. Often a hooked musky will want to lie on the surface and shake its head. The bigger the musky the more awesome this sight becomes and the more water it throws, but if you don’t do something about it the musky will lay there and thrash until it shakes your hook. The way around this is to initiate the fight — bury your rod tip under the surface of the water and crank hard on your reel. Sure, you’re “horsing” the fish, but eventually it will start fighting in a conventional manner. I would venture to guess that half of the muskies that are lost every year get away at boatside. Every experienced musky angler has likely been on both sides of blown net jobs, but usually when a musky is lost at the boat it’s because a shorter line accentuates the torque of their thrashes — every headshake, every jump, every roll puts that much more stress on the line and the point in the mouth where they’re hooked. For this reason, I use my thumb to give a fish line when it wants it, rather than rely on my reel’s drag. A drag is a mechanical entity, and any hesitation on its part can be enough to pop the hooks free from a big musky. Every time I have a musky a short distance from the boat I will have the reel in free-spool and will be controlling the line with my thumb until the fish is in the net. Netting a musky is a team effort. The angler fighting the fish should pull the musky parallel to the boat toward the net, while his partner sweeps the net toward the fish. Neither should stop until the fish is completely in the bag. 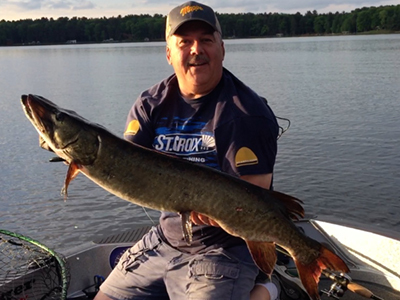 When a musky strikes, you’ve got about 60 seconds to do things right. Follow these tips, and your minute will be well-spent.